We’re all on great form on Saturday morning. After a leisurely breakfast, Imogen and Rosa turn up to accompany Anna and Maddy to Arianna’s party. Each of the little girls is in their Arna costume. Contrary to stereotype, they’re delighted to be identically dressed, proclaiming they’re twins. Rosa’s missing her red cape and with the generosity she so often shows, Maddy offers to let her play-mate wear hers – at least until they get to the party! Their imagination fascinates me. Dressed up, these two really seem to become Arna; it’s way beyond pretending. 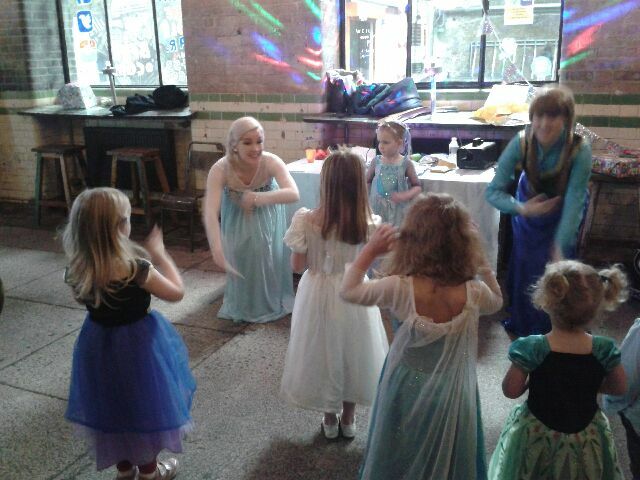 Maddy (left) at the party, entranced by ‘Elsa’ (second left) – still without her cape! I spend the rest of the morning after they’ve gone doing the blog, catching up with household chores and nibbling away at the dross. I also print the opening chapters of my novel to have a final read through before I send to Clare. Having printed them off, I begin to the process over a somewhat ‘acid’ lunch at Il Molino (here’s hoping the rice will counter-balance the pasta.) I have my first-ever soya latte and it’s not bad at all. It seems to bring out the roasted flavour of the coffee more than milk does. I’m also pleasantly surprised by Between Camps, which I haven’t even looked at since the summer of 2013. The first few pages, at least, seem tightly-written still. But is it too much of a ‘slow-burner’? I’m a sucker for the leisurely majesty of novelists like Thoman Mann and Rohinton Mistry. But even Mann would find it hard to get published today, in the era of the shallow and easy readerly satisfactions represented by the likes of Martin Amis or Hanif Kureishi – let alone the best-selling but instantly forgettable – and forgotten – ‘literary’ thrillers / crime fiction which pollute our bookshops (there are honourable and enviable exceptions, of course). Still, perhaps I’m being too pessimistic. Mistry and Hilary Mantel have made it – not that I’m so egotistical as to think I come anywhere near them in the scheme of things. It seems strange, given what’s happened to me, to be getting back into the world of Walter Bauer, my protagonist, and his traumatic experience of separation from his Jewish girl-friend when her family flees after the anschluss. Subsequently, an unwilling participant in the Occupation of France, Walter’s ‘liberated’ from his duties when he’s diagnosed with TB. He’s eventually cured by a mad French doctor in the Vichy-zone Pyrenees (he doesn’t want to go back to Austria for various reasons), where he’s sent to complete his death sentence. Now look at me! I have the same intermittent, irritating cough which first alerts Walter to his problem. I’ve been diagnosed with a comparably deadly disease in my lungs which I’ve also been told is incurable. Like Walter, the therapies which appear to be under offer to contain it seem deeply unpleasant (at least he never has to grow breasts!) Like Walter, I have to adjust my life radically while being radically uncertain about what’s to come. Like Walter, I accept that the battle can only be won, if at all, by engaging mind and spirit as well as matter. Yet perhaps re-connecting with the novel’s a good omen, after all. Walter does finally get cured in 1943, very shortly before the TB cure was accidentally discovered in the US (I researched and faithfully adapted the ‘gifted amateur’ process by which it was, simply shifting events to France; that’s a quite amazing story in itself and someone should make a film about it!) So long as what befalls Walter afterwards doesn’t happen to me! After lunch it’s to Anna’s. She’s expecting her father John, who’s bringing ‘meals on wheels’ prepared by his Lebanese partner Ahmad, a fabulous exponent of the cuisine of the region – which just happens to be my favourite! Before he comes, I play with Maddy. I don’t think I’ve ever heard her laugh so much ever before. It’s a brilliant sign, give our recent worries about her. First of all, I pretend she’s my mummy, mimicking many of the phrases she uses with Anna, and the physical gestures which accompany them. Despite pretending to be scandalised, Maddy can’t stop giggling. ‘Do it again, daddy, do it again,’ she exhorts each time I stop. Then it’s what the two of us have christened ‘chin-work,’ which involves me tickling her under her chin, seemingly the most sensitive part of her body. Again, she can’t get enough, even as she tries to press her chin down onto her chest so I can’t get my fingers under. Finally, it’s raspberries on her belly-button. I have to pull her hands away each time, trying to make each blast successively louder and longer. I only stop when she’s getting too red in the face. I love this physical play with her, but I well remember how, at her age, I was sometimes tickled until I couldn’t breathe and overpowering panic set in. Tea with John, who’s very affable, is enjoyable. I haven’t seen Anna’s dad since my diagnosis and he’s very kind and concerned, though perhaps a bit surprised at how ebullient I am (my energy seems to swing wildly from day to day). I drop a chance remark about ‘the big day’ and, to my great surprise, Anna confesses she hasn’t mentioned it yet. ‘I’m so pleased you two are getting married,’ John reassures her once the news sinks in. ‘I’m really sorry I didn’t ask you for her hand first, John,’ I joke. We laugh further over the idea of him becoming my ‘father-in-law’ and again when he asks what sort of party we’re going to have later. He looks a bit startled at this unexpected evidence of my extravagant streak. ‘Yes, of course it has to be memorable,’ he affirms uncertainly. We move onto other things. John’s extremely well-informed, partly because he’s had a number of different political affiliations in his life, from the anti-apartheid movement, to revolutionary socialist microgroups and, more recently, to Zionism (he was an adopted child who discovered his Jewish roots later in life. Thereby Anna is half-Jewish and Maddy a quarter-, in case some idiot thinks I’m even remotely anti-Semitic, simply because of my opposition to the way Israel has always treated the Palestinians). We (instinctively, tactfully?) don’t really talk about Israel / Palestine but I know that he’s done progressive work there, for example teaching in Beir Zeit University law-school (John’s an academic lawyer); and he’s strongly condemned the suppression of the Southampton conference. His position as a Zionist, albeit not of the fundamentalist neo- variety, thank goodness, has exposed him to vituperation from both sides of the conflict and their proxies. Though I don’t really agree with much of what I’ve read of his analysis of the issues, I respect him as someone inhabiting a more difficult ‘in-between’ position than those of us who clearly privilege one narrative over the other. And he’s a warm and gentle man, full of insights into all manner of things, from the surge in Ed Miliband’s electoral standing (John was against him becoming leader) to the establishment cover-up of child-abuse, another of my current bug-bears. Just this last week a group of seven ‘ordinary’ paedophiles were disgraced in public and received long, long sentences. They’d even been investing for the future by befriending pregnant women to gain their trust for later. Yet like the M.P., Cyril Smith before him (long dead now), Lord Janner, against whom very serious accusations are currently being made, will apparently not be prosecuted. The Crown (or should that, following the recent Elvedon fiasco, be Clown) Prosecution Service believes it wouldn’t be ‘in the public interest’ because Janner has been diagnosed (by whom, I ask myself?) with dementia. The police are so outraged, they’re apparently pondering legal action against the CPS. As that alone suggests, surely it’s in the public interest to rehearse the case, even if the man can’t be sentenced – or exonerated – not least because it might give satisfaction to his many alleged victims – or disprove their allegations. It might also provide explanations for why, as The Guardian also alleges in a related story, Janner was protected from investigation years ago, when the police were onto him and he was in full possession of his powers. Why hasn’t The Sun been after him? After all, it’s always encouraged all sorts of surveillance and vigilante initiatives against ‘ordinary’ paedophiles in the past. Yes, I wonder why not… Who’s been protecting Janner, if that’s what’s happened – why? Surely it’s in the public interest, if not the Establishment’s, to know? Sorry to bang on about this – but anyone with a three-year-old child will understand my concerns. This is not to say that I think paedophiles are ‘monsters’ in the way they’re usually depicted in the media. I think they are ‘simply’ very sick people psychologically and much more proper psycho-medical research needs to be done into the problem and its remedies. Not least, because if more was known about it, psychological profiling could keep at least some of them out of the positions of trust they then so grievously abuse. Child abuse, as I’ve said in a previous post, is an appalling problem in our country. 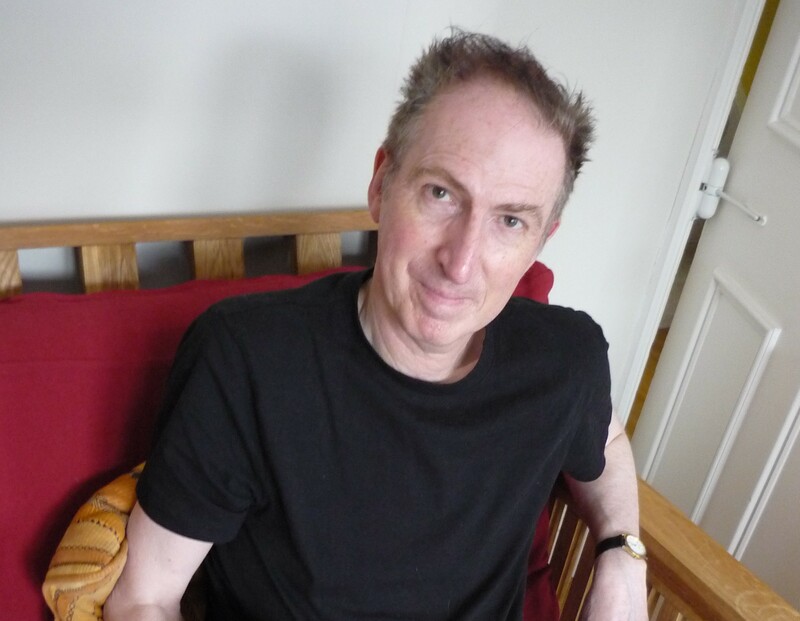 John wonders whether it doesn’t seem worse in the UK than elsewhere because we’re ahead of the game in terms of public debate and investigations – and the same litany of horrors may well come out in other places. But the best marker that we mean to deal with it seriously once and for all, in my opinion, would be to thoroughly and publicly investigate figures like Janner who many regard as untouchable because of their Establishment connections. From Anna’s, I head home and start re-reading Ghassan Kanafani’s Return to Haifa, a searing account of the consequences for ordinary Palestinians of the mass ethnic cleansings of 1948 – just in case Robert Young goes along with my proposals about how to rejig my Introduction for his journal. I love Kanafani, one of the founders of modern Palestinian literature, who was blown up in a car-bomb in Beirut in 1972, an act of terror very widely ascribed to Israeli secret ‘security’ services. Much though I enjoy him, however, I’m relieved that it isn’t the novel I misremembered it as, but a shortish novella which won’t take long to read. I think it’ll work very well for my purposes. Soon it’s time to head off to meet my friend and comrade Naomi Foyle, another hugely talented writer and committed activist whom I first met during my Information Tribunal action against Michael Gove. I was put in touch with her by someone because she was working on parallel lines to me, pressing the Department for Education about their gross hypocrisy in allowing London school-children to be exposed to Zionist propagandists like the Israeli Amabassador but imposing all sorts of impossible conditions relating to ‘balance’ in relation to their participation in (entirely non-Palestine related) writing work-shops – simply because these were hosted by the Haringey Palestine Literature Festival. She became one of my witnesses at the ‘trial,’ her evidence of bias proving completely unanswerable for the hapless DfE representative and we’ve been firm friends since. Naomi: what a healing smile! At about the same time, she published what proved to be the most enjoyable novel I read in 2013, Seoul Survivors. It’s a beautifully-written, zippily expressed, fast-paced. It offers a glimpse into a future world with a substantial resemblance to contemporary South Korea, a place so alien to the average westerner that it functions superbly as both a ‘real’ and futuristic setting. If you want a lot of laughs and some superbly-crafted characters, including some truly loathsome but compelling villains, add it to your list and enjoy! And look out for what she’s written since, particularly if you like avant-garde S.F. – not to mention her poetry. Naomi’s up in London from Brighton, where she lives, for the History Matters conference, investigating the lack of history students and teachers of African and Caribbean heritage in the UK.. The first thing I notice when we meet in Whole Foods is the quality of her hug. Somehow she seems to envelop me top to toe, and transfer lots of positive energy. Not the hasty gesture I’m generally used to with British friends. We chat about things until she suddenly breaks off and tells me she’s persuaded her ex-agent to agree to read some of my novel. Heavens! Like buses, you wait forever for one, then they come in bunches! Anyway, I’m very grateful. The one unwritten rule I’ve learned since trying to be a writer is that you don’t ask anyone to introduce you to their agent. You have to find your own, you own way. We decide I’ll wait until I hear back from Clare Conville before going down that route. After more chat, I remind Naomi that she’s agreed to do a brief Tarot reading for me. 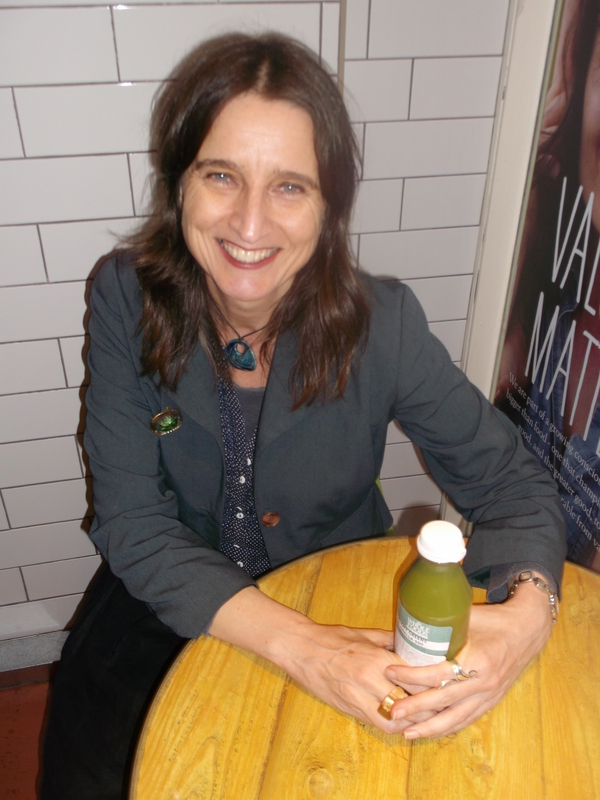 It’s one of her many talents and she supplements her living (she’s a .25 Tutor in Creative Writing at Chichester University) doing it in Brighton when funds are short. Knowing nothing about Tarot, but intrigued, and trusting in Naomi’s expertise, I’d been hoping to find out not about the future, but about the past viz. when this wretched cancer started. As she gets out her Crowley deck, unwrapping it carefully from a fine-looking brocade cloth, she says that isn’t possible. It’s best used for general questions one might have about one’s life. ‘What do they mean?’ I ask. ‘OK.’ Interestingly this latter advice echoes Gabi’s yesterday. Extraordinary coincidence? or something else? We each take sip of our drinks. So perhaps anger has been a problem for me, even though I don’t feel it’s in any way ‘caused’ or even contributed to my disease (but is this simple denial?). Indeed, I think I’ve always been able to express my views and emotions pretty clearly, including to those in authority over me, whether self-important line-managers, bureaucrats, politicians etc., often rather too forthrightly for their taste. At another level, beyond my little universe, injustice has also always made me angry, whether it’s the class-ridden nature of British society, tax-dodgers, the poisonous influence of lobbies, Big Business, racism, our super-vile and corrupt Establishment; or, further afield, ongoing neo-colonialism and the appalling way the Palestinians have been treated. Again, I’ve usually tried to do my mite (not nearly enough and what I’ve done has, frankly, always been from a position of relative privilege) to address these issues when opportunity arises. Isn’t that kind of anger energising and mobilising – and, above all, necessary – for initiating the myriad tiny steps we can all make to change the world a tiny bit for the better? I need to think about this issue more. 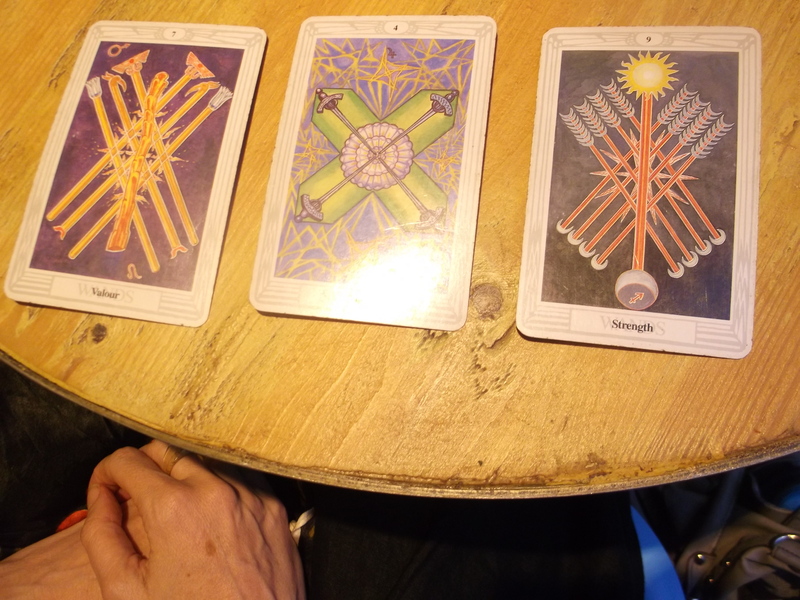 Still, as Naomi reminds me, the cards aren’t there to give answers or solutions, but to make one reflect on matters pertinent to the question I asked at the time the cards are dealt – not for all time. She’s as committed as I am to the cause, so I know she’s thinking of what’s in my best interest when she nods. That was Haim’s advice, too. Leave it to others for now. Same with Establishment cover-ups of child-abuse. I feel a little guilty. But perhaps I’ll be much more effective in the end if I let myself heal properly over the next few months. On my way to Anna’s, I think about Ego. Perhaps my meeting with Naomi has exactly illustrated this problem. It was mainly about me. After a few preliminary questions asking how she was, I banged on about matters Naomi’s already well aware of from reading the blog. Only towards the end, after the Tarot reading, as the impatient workers were stacking chairs and mopping the floor around us, did I press her about what’s going on in her own life – love, work, accommodation and career, all of which, I know, have been giving her cause for concern. There wasn’t time to talk everything through properly, partly because by then I was also beginning to ‘fade’ rapidly, as is my wont around 8 in the evening. Nonetheless, I recognise with a stab of shame, perhaps I could have made more effort to conquer my tiredness. I feel I’ve let my generous friend down, taken too much and given too little. My only consolation is that (I think) I’m open to (self-)criticism and a quick learner. Time will tell. It’s nice to relax at Anna’s, just the two of us. Maddy’s having a sleepover at Caroline’s where Gemma, Georgia-May and Tara are entertaining her. It’s been a very full day emotionally. Whatever upheaval all this commotion has caused, I nonetheless feel I’m learning some useful stuff about myself which is going to serve me well in the future. Not too much to report about Sunday. It’s a horrid cold day, for a change, and I take advantage of a gathering of the wider clan in Balham to sneak away and get on with stuff. It takes me quite a while to write up the account of Saturday because I’m still working through some of the issues. But I have a renewed sense of how useful, the exercise of writing is for me, even if I’m boring others senseless! Through it, I really pin down my concerns and emotions, making them (I hope) easier to work thorough. Afterwards, I read the rest of the opening of the novel which I’m going to send to Clare. That, too, reads much better than I remember. There’s very little to do beyond changing a word here, ironing out a clumsy phrasing there. Then I gingerly try some Pilates exercises. I’m getting stiffer and stiffer by the day and really have to do something about it. Sitting at my desk so much isn’t helping. At Google, or Apple, they now all work at their stations standing up, their mantra being ‘sitting is the new smoking.’ Perhaps they’re responding to the extraordinary research which investigated why bus conductors live on average five years longer than their drivers. But I’m not able to do much stretching before I get very tired.